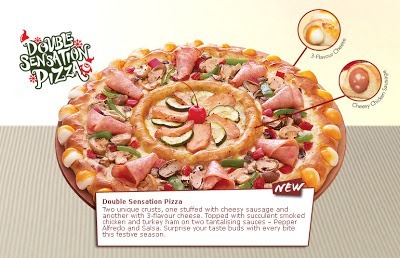 “…the Double Sensation is so named because it features not one but two rings of crust. The outer ring is stuffed with melted mozzarella, parmesan, and cheddar cheeses which ooze out at intermittent holes in the crust, while the inner ring is filled with chicken sausage with bits of cheese inside. Instead of picking up chicks with my new flying car we’ve spent the last 50 years investing in new technological advances solely for cat litter and pizza.